I am devasted by the news of the Notre Dame Cathedral fire which occurred on Monday evening (15/04/19) and I cannot begin to think of how the people of Paris must be feeling right now. Our Lady of Paris is a beautiful piece of history, over 850-years-old. It has survived World War One, World War Two and The French Revolution. It brings not only beauty to the city of love, but also radiates faith and love as well as being filled with many incredible ancient artefacts. This ancient cathedral took almost 200 years to complete. The construction began in 1163 and it was officially completed in 1345. Notre-Dame de Paris (Our Lady of Paris in French) is located on a small Parisian Island called Ile de la Cite in the middle of the River Seine. Over the 850 years of its existence, Notre Dame Cathedral has been the centre of many historical events. In 1431, Henry VI of England was crowned in the cathedral. He is not the only historical figure to be crowned here, Napoleon was crowned emperor in 1804, years after he saved the Cathedral from being demolished. The cathedral has been restored on many occasions. In the midst of World War two, it was rumoured that the German soldiers planned to destroy the newly installed stained glass windows and so they were removed to avoid damage and were only reinstalled once the war was over. The Rose Window is the largest glass window in the world, which was produced in the 13th century. This feature alone attracted tourists from all over the world and has been known to draw many people to their journey of faith. 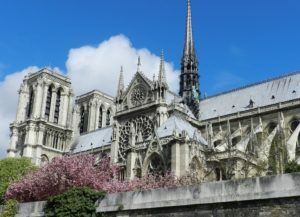 This incredible cathedral is also home to many artefacts, including drawings, plans and engravings which show the old and hidden mysteries of several of the church developments and how the city of Paris came into existence. Inside the cathedral, you can also find a 17th-century organ with all of its parts fully functioning. It also has an ancient bell tower, with a 140 step staircase leading to the top. The architecture of this building is something that millions of people travel far and wide each year to see. This wonderful place has captured the hearts of every visitor, not just Catholics. Joan of Arc was a young peasant girl who claimed to have visions of God. She had both spiritual and character richness, but no material goods to her name. She believed that God had chosen her to lead France to victory in their long-running battles with England. She persuaded prince Charles of Valois to allow her to lead a French army to the city of Orleans where they received a momentous victory over the English and their French allies, the Burgundians. After Prince Charles was crowned king, Joan was captured by Anglo-Burgundians, who burned her at the stake for witchcraft and heresy at the age of just 19. She was officially canonized (considered a saint) in 1920. 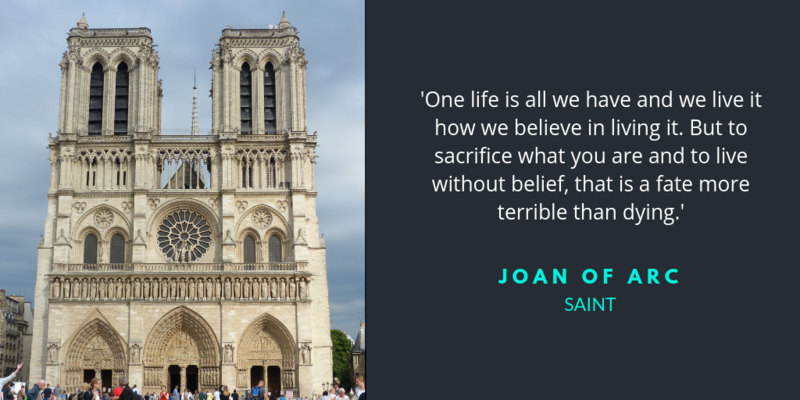 You can read more about the life of Joan of Arc here. 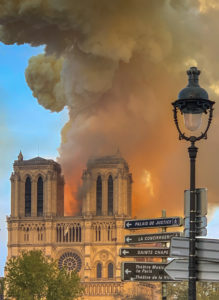 Recently a terrible and tragic fire broke out in Notre Dame Cathedral on the evening of 15/04/2019. The fire began at around 7:00pm local time. An open investigation into the fire is currently in place, though it is believed the events occurred as a result of the construction work that was being done on the cathedral. The fire spread quickly, engulfing the roof in flames and destroying the spire. Thousands of locals and tourists took to the streets, crying and praying as they watched the events unfold before their eyes. A video has circled the internet of Parisians singing hymns as they stand in solidarity before the flames. Over 400 firefighters battled the flames for approximately 12-hours. It has been reported that the 17th-century organ appears to be intact, along with the two main towers and the facade of the building still standing strong. 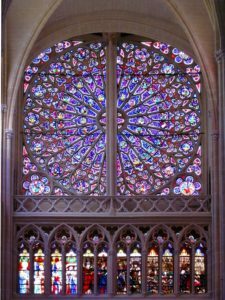 Up to now, there has been no official report stating the fate of the beautiful stained glass windows, though some images have circled social media showing the Rose Window still intact, we can only hope that this is the case. Many of the artefacts have been saved, though some have experienced smoke damage they are still well presented. These will be moved to The Louvre over the next coming days. A donation campaign has been put in place in France in the hope to raise funds to put toward the restoration of the famous cathedral, though it could take decades to repair the damages from the blaze. The company VMMHF (who own brands such as, Givenchy, Christian Dior and Louis Vuitton) and the family of CEO Bernard Arnault made the biggest pledge of €200 million. Total, a major oil and gas company in France have pledged €100 million. The Pinault family, who control French luxury conglomerate Kering (owning YSL and Gucci) also pledged €100 million. These contributions came in within 24 hours of the blaze taking place. Ensuring that at least €400 million will be spent on restoring the beautiful cathedral back to its former state. With the help of technology and exceptional craftsmen, it is believed that the cathedral could be restored to its original design. An inpour of ongoing support and hope has taken over social media, with many people making reference to the York Minister fire which occurred in England in 1984. The York Cathedral fire also destroyed the roof of the building, just as the Notre Dame fire has. The beautiful York cathedral was restored, resembling its original design. The Rose Window of York Cathedral was also saved, despite it being cracked in over 40,000 places. This brings a great level of hope for Notre Dame and the likelihood of it being restored to its former beauty. England also seen a devastating fire at the iconic Windsor Castle in 1992, this beautiful building was also restored, despite more than 100 of the rooms of the building being destroyed. Enter your email address to receive notifications of new blog posts and updates! Recent Posts For You To Enjoy!